Rachel Galvin was featured in a music video directed by Troy Bernier of Ginnungagap Filmwerks. The singer is Scott Opiela and the song is “Time to Go, The Sacrifice.” Shooting took place on Aug. 14. The setting was a distant planet. 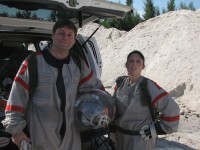 Galvin played an astronaut who must run for her life. NASA may be shut down, but the dreams of planetary travel live on. The outfits may not be as elaborate as a Lady Gaga video, but they were custom-made. The song is part of the soundtrack for a fun sci-fi romp called “Planeta Desconocido,” a film guaranteed to be unlike anything you’ve seen before. Featuring green screen shots, Tron-esque graphics and a futuristic landscape, the film is a bit like a video game with a game of cat and mouse between good and evil with tragic results. This entry was posted in Acting and tagged Andrew Brown, Lady Gaga, music video, NASA, Planeta Desconocido, Rachel Galvin, sci-fi, Troy Bernier. Bookmark the permalink.